ah? for 2.501b??? must have been updated then. does it work well? Sure, I guess. It doesn't crash or anything. It also lets you configure the keyboard controls. marus wrote: Sure, I guess. It doesn't crash or anything. It also lets you configure the keyboard controls. Any news on the limited edition (other than the price)? marus wrote: Any news on the limited edition (other than the price)? marus wrote: I have a boss patch for 2.501b, if you want it. does it work on net play? if both players have it installed it does. The text and dialogue for the PS2 Act Cadenza was similar to the PC game. Act Cadenza for the PS2 has already been translated, so it might not be too much work to create a patch for the PC port. After a long vacation from being a typemoon fanboy. I found such great infos! MB is now translated! ya! baby! TheXEV your awesome! and...... AC ver.b is coming to the pcs! OMG damn i feel so excited that im gonna burst! ... I mean blood heat. Only one thing thats bothering me... Will anyone try to make a keyconfig for MBAC(V.B):PC? 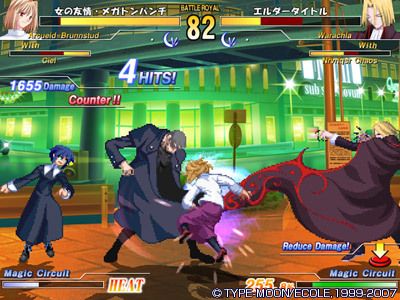 PS2 Act Cadenza is a combination of two versions of the game: Melty Blood: Act Cadenza ver.A (Arcade Mode) and Melty Blood: Act Cadenza ver.A2 (Original Mode). It's not actually called ver.A2 but it's not yet ver.B either. For example, Ciel regains clash frames in ver.B (Arcade) that she did not have in ver.A2 (PS2 Original), and Ren can control which cat she puts down. If PS2 really was ver.B, then you'd be seeing glitches with Sion's super armor too(which is why ver.B2 was introduced in the first place). Therefore, the new PC version of MB:AC ver.B2 isn't really a port of the PS2 version, it's a port of the Arcade one. Can you clarify on the speed bit? Do you mean the ps2 version is set by default to run faster than the arcade version? It seems so. At least, when you compare Arcade ver.A with the PS2 version, there is DEFINITELY a speed difference where the PS2 is faster than the Arcade default. Well it's on the official website for those who missed it. It seems that there'll be a 2v2 tag-team type as well. someone broke the act cadenza arcade machine we had at our local arcade...you think i could buy off the pcb from the owner? does that sound crazy or does it seem doable? As far as I know, Act Cadenza runs on Sega's NAOMI hardware, which is essentially a more powerful version of the Dreamcast. Regular Dreamcast emulation on the PC is spotty at best, and to my knowledge NAOMI games are not at all supported in MAME. Even if they were, I doubt the PSP would be able to handle them.